A sure sign that summer is ending is fall shots. You're probably imagining men in orange shooting at birds, but I'm talking about something else entirely. "Fall shots" to us means bringing the cattle home to give the calves boosters of the vaccinations they were given this spring. The cattle have been out on summer pastures since May. Naomi and I moved the herd to a pasture closer to the corrals the day before we worked them. 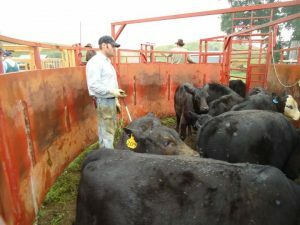 "Working" cattle is a catch-all term for sorting, giving shots, castrating, pregnancy testing, and so on. This time, it's just the fall shots. These vaccinations guard the calves against roughly 15 diseases. 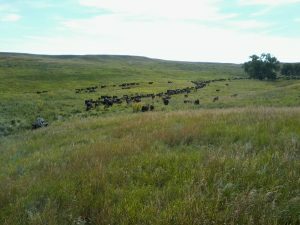 There were 240 pairs in the herd, which means 480 cattle all together. A "pair" refers to a mother cow and her calf. You may imagine a dusty, thundering herd of cattle stampeding down the valley with Naomi and I whooping and hollering behind them, but it was quite the opposite. We try to keep the herd as quiet and calm as possible. Being outnumbered 480 to two, we can't expect to out-muscle them! Once they understood it was time to move home, they strung out and moseyed their way down the hills. Naomi led them with a bucket of cake (doggie treats for cows) until they started through the last gate. 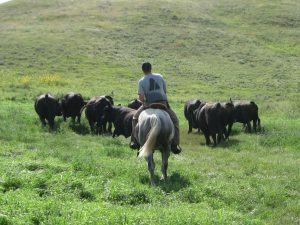 After getting the herd moved home, we sorted the bulls out. They had been with the cows since July 2. 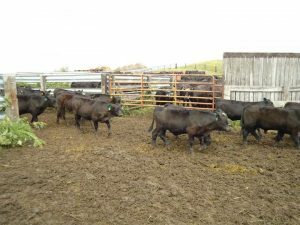 By only allowing the bulls to be with the cows for 60 days, we can manage when the calves are born. This allows for a more uniform group of calves in the fall when we wean them. By keeping them relatively the same age, we can better manage their diet over the winter. 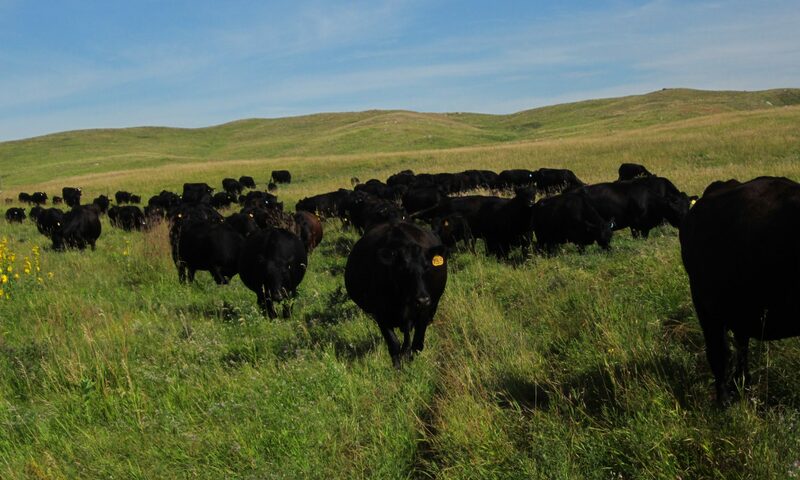 Back to the bulls for a minute…we kept between nine and 11 bulls with these cows over the 60-day breeding season. This means each bull is responsible for breeding about 24 cows, although that number varies. The next day, we began gathering the cattle shortly after dawn. This time of year can still get pretty warm, so we try to get all the cattle work done while the temps are comfortable for both man and beast. After moving them into the corral, we sorted the cows from the calves. 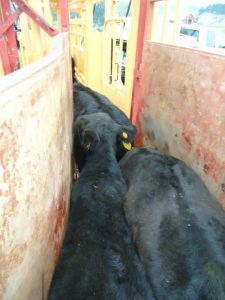 The calves were directed through the tub and alley into the chute. It was my job to fill the alley. The design of the tub and alley was made popular by Temple Grandin, a world-renowned cattle handling expert. The solid walls prevent the cattle from being spooked by things outside the pen. It also makes it easier for them to find the way out. The curved alley helps the cattle to keep moving, as their natural instinct is to go around things. After getting their shots, the calves are returned to their mothers. If you look close, you'll see green in the ears of some calves. This is tattoo ink. The heifer (female) calves are vaccinated against brucellosis. As proof of this vaccination, a special tag and tattoo are given that identify the year it was given. After a couple hours, the cows and calves were pretty well paired up. This is always a miracle to me. How on earth a cow can pick her calf out of 239 others simply by smell is inexplicable. We opened the gate and the cattle moved back out to pasture. The next time they come home will be early November. We'll be weaning the calves at that time. If you have any questions, just leave a comment and I'll get back to you!